• Global Equities Slump. U.S. stocks slumped on Friday, following foreign markets lower after President Trump doubled tariffs on aluminum and steel imports from Turkey to 20% and 50% respectively, widening Turkey’s already dire economic crisis. Friday’s pullback erased weekly gains for the Dow and S&P 500, while the Nasdaq Composite pared weeklong gains. • Weekly Performance. For the week, the S&P 500 declined by 0.18%, ending a five-week rally, the Dow Industrials fell 0.59%, and the tech-heavy Nasdaq Composite gained 0.40%, but snapped an eight-day winning streak. • What Went Wrong for Turkey? Turkey’s economy has reeled recently as its central bank keeps interest rates low even as inflation rate reached 16% last month, well above their central bank's 5% target. Turkey’s lira, which fell as much as 20% last Friday, reached a fresh record low on Monday. • Core Prices Rise. The headline and core consumer price indices (CPI) each rose 0.2% in July, while the annual increase in the core CPI (excludes volatile food & energy prices) was 2.4%, the largest year-over-year (YoY) rise since September 2008. The headline CPI was unchanged at 2.9% YoY. Separate data showed that real weekly wage growth slowed to 0.1% last month, down from a revised 0.5% increase in June. • Consumer Sectors End as Opposites. Eight of the 11 major sectors posted ended negative for the week, with Consumer Staples (-1.87%), Real Estate (-1.80%) and Industrials (-0.92%) down the most. Meanwhile, Consumer Discretionary (+0.81%), Telecom (+0.69%) and Technology (+0.44%) outperformed. • Bond Prices Advance. Treasurys rallied, sending the 10-year yields below 2.9% as July CPI data added weight to the Federal Reserve’s gradual rate hike views, while the U.S. Dollar capped its strongest week since June. For the week, the U.S. Dollar Index gained 1.26% to end the week at 96.357, while the yield on 10-year Treasury notes fell 5.3 basis points to 2.874%. These links to outside web sites are provided as a courtesy and are not under the control of Cetera Investment Management LLC. For more details, please see the “Disclosures” section. Friday, August 17: Leading Economic Indicators, Consumer Sentiment. U.S. stocks have been confronted with rising bond yields, widening credit spreads, an uptick in inflation, and the constant threat of a trade war breaking out between the U.S. and China. Despite these risks, the S&P 500 has grinded higher thanks to strong earnings growth that has exceeded 20%, tax reform for corporations and individuals, and strength in the economy. From a performance perspective, returns have been solid and the S&P 500 has almost fully recovered from the February correction. The market felt volatile over the first few months of the year, especially in comparison with 2017's calm, but this year has turned out to be a rather "normal" by historical standards. Chart 1 above displays the number of positive and negative months for the S&P 500 in each calendar year since 1990. The only year where stocks were positive every month was 2017. Since 1990, the average number of negative months for stocks has been 3.6, or roughly three to four times a year. Years which have resulted in negative performance for stocks, like 1990, 2000-2002, and 2008, witnessed six or more months of negative returns. 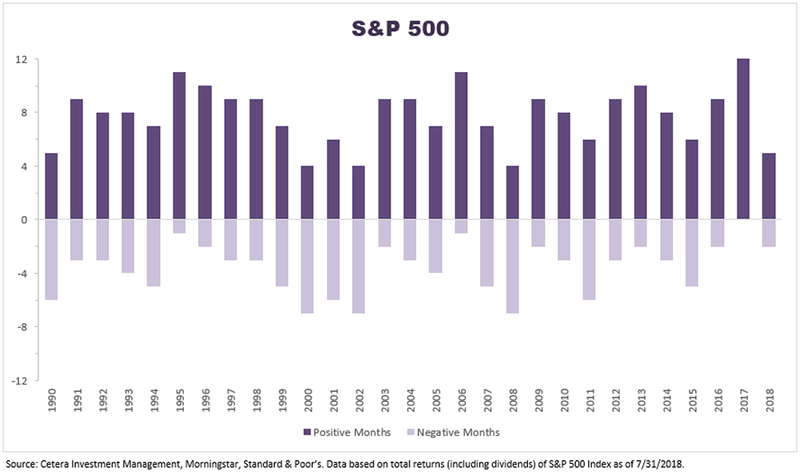 So far this year, the S&P 500 has recorded five positive months and just two negative months. Both figures are on track to finish at a level that is near the average since 1990. We may experience additional volatility going forward as the Fed normalizes interest rates, but that is a typical occurrence as a bull market matures. This report is created by Cetera Investment Management LLC. Cetera Investment Management LLC is an SEC registered investment adviser owned by Cetera Financial Group®. Cetera Investment Management provides market perspectives, portfolio guidance, and other investment advice to its affiliated broker-dealers, dually registered broker-dealers and registered investment advisers. Cetera Financial Group (“Cetera") is a leading network of independent firms empowering the delivery of professional financial advice to individuals, families and company retirement plans across the country through trusted financial advisors and financial institutions. Cetera is the second-largest independent financial advisor network in the nation by number of advisors, as well as a leading provider of retail services to the investment programs of banks and credit unions. Through its multiple distinct firms, Cetera offers independent and institutions-based advisors the benefits of a large, established broker-dealer and registered investment adviser, while serving advisors and institutions in a way that is customized to their needs and aspirations. Advisor support resources offered through Cetera include award-winning wealth management and advisory platforms, comprehensive broker-dealer and registered investment adviser services, practice management support and innovative technology. For more information, visit ceterafinancialgroup.com. "Cetera Financial Group" refers to the network of independent retail firms encompassing, among others, Cetera Advisors, Cetera Advisor Networks, Cetera Investment Services (marketed as Cetera Financial Institutions), Cetera Financial Specialists, First Allied Securities, and Summit Brokerage Services. All firms are members FINRA/SIPC. The material contained in this document was authored by and is the property of Cetera Investment Management LLC. Cetera Investment Management provides investment management and advisory services to a number of programs sponsored by affiliated and non-affiliated registered investment advisers. Your registered representative or investment adviser representative is not registered with Cetera Investment Management and did not take part in the creation of this material. He or she may not be able to offer Cetera Investment Management model management services. Nothing in this presentation should be construed as offering or disseminating specific investment, tax, or legal advice to any individual without the benefit of direct and specific consultation with an investment adviser representative authorized to offer Cetera Investment Management services. Information contained herein shall not constitute an offer or a solicitation of any services. Past performance is not a guarantee of future results. For more information about Cetera Investment Management, please reference the Cetera Investment Management LLC Form ADV disclosure brochure and the disclosure brochure for the registered investment adviser your adviser is registered with. Please consult with your adviser for his or her specific firm registrations and programs available. All economic and performance information is historical and not indicative of future results. The market indices discussed are not actively managed. Investors cannot directly invest in unmanaged indices. Please consult your financial advisor for more information. Links to outside web sites are provided as a courtesy and are not under the control of Cetera Financial Group or its affiliated firms. We make no representation as to the completeness or accuracy of information provided at these web sites. Nor is the company liable for any direct or indirect technical or system issues or any consequences arising out of your access to or your use of third-party technologies, web sites, information and programs made available through this web site. When you access one of these web sites, you assume total responsibility and risk for your use of the linked web sites. The Bloomberg Barclays US Aggregate Bond Index, which was originally called the Lehman Aggregate Bond Index, is a broad based flagship benchmark that measures the investment grade, US dollar-denominated, fixed-rate taxable bond market. The index includes Treasuries, government–related and corporate debt securities, MBS (agency fixed-rate and hybrid ARM pass-throughs), ABS and CMBS (agency and non-agency) debt securities that are rated at least Baa3 by Moody’s and BBB- by S&P. Taxable municipals, including Build America bonds and a small amount of foreign bonds traded in U.S. markets are also included. Eligible bonds must have at least one year until final maturity, but in practice the index holdings has a fluctuating average life of around 8.25 years. This total return index, created in 1986 with history backfilled to January 1, 1976, is unhedged and rebalances monthly. The Bloomberg Barclays US Corporate High Yield Index measures the USD-denominated, non-investment grade, fixed-rate, taxable corporate bond market. Securities are classified as high yield if the middle rating of Moody's, Fitch, and S&P is Ba1/BB+/BB+ or below, excluding emerging market debt. Payment-in-kind and bonds with predetermined step-up coupon provisions are also included. Eligible securities must have at least one year until final maturity, but in practice the index holdings has a fluctuating average life of around 6.3 years. This total return unhedged index was created in 1986, with history backfilled to July 1, 1983 and rebalances monthly. The Bloomberg Barclays US Municipal Bond Index covers the USD-denominated long-term tax exempt bond market. The index has four main sectors: state and local general obligation bonds, revenue bonds, insured bonds, and pre-refunded bonds. Many of the subindicies of the Municipal Index have historical data to January 1980. In addition, several subindicies based on maturity and revenue source have been created, some with inception dates after January 1980, but no later than July 1, 1993. Eligible securities must be rated investment grade (Baa3/BBB- or higher) by Moody’s and S&P and have at least one year until final maturity, but in practice the index holdings has a fluctuating average life of around 12.8 years. This total return index is unhedged and rebalances monthly. The Bloomberg Commodity Index is a broadly diversified index that measures 22 exchange-traded futures on physical commodities in five groups (energy, agriculture, industrial metals, precious metals, and livestock), which are weighted to account for economic significance and market liquidity. No single commodity can comprise less than 2% or more than 15% of the index; and no group can represent more than 33% of the index. However, between rebalancings, group weightings may fluctuate to levels outside the limits. The index rebalances annually, weighted 2/3 by trading volume and 1/3 by world production. The CBOE Volatility Index® (VIX®) is a key measure of market expectations of near-term volatility conveyed by S&P 500 stock index option prices. Introduced in 1993, the VIX Index has been considered by many to be the world's premier barometer of investor sentiment and market volatility. The MSCI All-Country World Index is a free float-adjusted market capitalization weighted index that is designed to measure the equity market performance of developed and emerging markets. The SMCI ACWI consists of 46 country indexes comprising 23 developed and 23 emerging market country indexes. The developed country indexes include: Australia, Austria, Belgium, Canada, Denmark, Finland, France, Germany, Hong Kong, Ireland, Israel, Italy, Japan, Netherlands, New Zealand, Norway, Portugal, Singapore, Spain, Sweden, Switzerland, the United Kingdom and the Uninted States. The emerging market country indexes included are: Brazil, Chile, China, Colombia, Czech Republic, Eygpt, Greece, Hungary, India, Indonesia, Korea, Malaysia, Mexico, Peru, Philippines, Poland, Qatar, Russia, South Africa, Taiwan, Thailand, Turkey and United Arab Emirates. The MSCI EAFE Index is designed to measure the equity market performance of developed markets (Europe, Australasia, Far East) excluding the U.S. and Canada. The Index is market-capitalization weighted. The MSCI Emerging Markets Index is designed to measure equity market performance in global emerging markets. It is a float-adjusted market capitalization index. The MSCI Europe Index is a free float-adjusted market capitalization index that is designed to measure developed market equity performance in Europe. The MSCI Pacific Index captures large and mid-cap representation across five Developed Markets (DM) countries in the Pacific region. With 470 constituents, the index covers approximately 85% of the free float-adjusted market capitalization in each country. The NASDAQ Composite Index includes all domestic and international based common type stocks listed on The NASDAQ Stock Market. The NASDAQ Composite Index is a broad based index. The Russell 2000 Index measures the performance of the small-cap segment of the U.S. equity universe and is a subset of the Russell 3000 Index representing approximately 10% of the total market capitalization of that index. It includes approximately 2000 of the smallest securities based on a combination of their market cap and current index membership. The Russell 3000 Index measures the performance of the largest 3,000 U.S. companies representing approximately 98% of the investable U.S. equity market. The Russell Midcap Index measures the performance of the mid-cap segment of the U.S. equity universe and is a subset of the Russell 1000 Index. It includes approximately 800 of the smallest securities based on a combination of their market cap and current index membership. The Russell Midcap represents approximately 31% of the total market capitalization of the Russell 1000 companies. The S&P 500 is an index of 500 stocks chosen for market size, liquidity and industry grouping (among other factors) designed to be a leading indicator of U.S. equities and is meant to reflect the risk/return characteristics of the large cap universe. The S&P GSCI Crude Oil Indexis a sub-index of the S&P GSCI, provides investors with a reliable and publicly available benchmark for investment performance in the crude oil market. The S&P GSCI Gold Index a sub-index of the S&P GSCI, provides investors with a reliable and publicly available benchmark tracking the COMEX gold futures market. West Texas Intermediate (WTI) is a crude oil stream produced in Texas and southern Oklahoma which serves as a reference or "marker" for pricing a number of other crude streams. WTI is the underlying commodity of the New York Mercantile Exchange's oil futures contracts. The U.S. Dollar Index is a weighted geometric mean that provides a value measure of the United States dollar relative to a basket of major foreign currencies. The index, often carrying a USDX or DXY moniker, started in March 1973, beginning with a value of the U.S. Dollar Index at 100.000. It has since reached a February 1985 high of 164.720, and has been as low as 70.698 in March 2008.